Peter was forced by the circumstances of his life to give that journey a considerable amount of thought. Having been diagnosed, while still a college student, with a form of cancer that was considered incurable, he knew for the rest of his life — more than most of us do about our own lives, I suspect — that his days were numbered. The experimental treatment program that added decades to his span of years — a span that we may still rightly feel was all too short — left him with an uncommon sense that each new day was a gift, that life was not something to be squandered, that it was to be enjoyed, pondered in its mysteries, and above all lived out in gratitude to God. Like anyone, Peter had to grapple with his doubts, his unanswered questions, his pains, and losses, and griefs. But he did so as a person of faith. His circumstances were often difficult, but his faith enabled him to live above his circumstances. His circumstances did not destroy his faith. On the contrary, his faith prevailed over his circumstances. It was not an easy struggle for him. His ongoing bout with cancer was an ongoing bout with death. But in the course of that deadly bout he learned the meaning of a key biblical virtue. It is a virtue that we often discussed in our weekly Sunday morning Bible study class, because it often comes up in the letters of St Paul. Peter was a faithful member of that class for more than twelve years. When we had to consider the theme of what St Paul called hypomone — a word that has no good English translation but which points to the the theme of patient endurance, of perseverance, of calling upon God in the time of trouble, of continuing to trust in the promises of God regardless of one's difficult circumstances, the theme of not losing heart — Peter paid particular attention. For him it was of more than theoretical interest. Peter was well aware of what Hamlet meant when he soliloquized about that undiscovered country, from whose bourn no traveler returns. But he did not quite agree with Hamlet. He did not quite agree, because he had somehow caught wind of a rumor, that rumor which, if true, meant that Hamlet had not quite gotten things straight. Despite everything that might count against it, Peter believed that this rumor was true. And because that rumor was true, Hamlet could not have the last word. It was not quite correct that from the boundary of that undiscovered country no traveler returns. Because a Traveler was known who had returned. This mysterious Traveler was the One who had not only returned, but by whose power that undiscovered country, that wasteland of death itself, had been robbed forever of its sting. It was this Traveler whom Peter believed would accompany him, and did accompany him, in life and in death. Better, it was this Traveler whom Peter believed that he himself was accompanying. It was this Traveler — the One who had returned from that undiscovered country with the joyful news that His love was stronger than death — it was this Traveler, whose name is Jesus Christ, whom Peter himself confessed, along with all the company of the faithful, as his only comfort in life and in death. In my last conversation with Peter, a few days before he died, he stressed that resurrection hope — the hope by which he himself had learned to live — was a hope for this life and not just for the next. He wanted the first Question from the Heidelberg Catechism to be included in his Memorial Service. We will recite it in a moment. “Tell them it’s not just a hope about death,” Peter instructed me. “Tell them it’s a hope about life. Tell them it’s our only comfort in life and in death, in life and not just in death.” Those were, in effect, his last words. How did Peter learn to live by this hope? This is a question which can have no easy answer. I will not try to do it justice but only to lift up one small piece of it. It concerns that piece in which I myself may have played a role, however modestly, as a figure in Peter’s life. I have already mentioned the weekly Sunday morning Bible study. But Peter also attended another class that I lead. He was a reguler member, again over a period of many years, of my Karl Barth Student Reading Group. Karl Barth was a great theologian, though, as anyone knows who has tried it, not an easy theologian to understand. Peter did not just attend the Barth Reading Group. He really read Barth. And what impressed me was that he was always eager for more. He would ask me about what were the best ways to get his hands on the writings of other great teachers of the church, like Calvin, like Luther. Peter read them too. He read them seriously. He made them integral, I suspect, to his urgent quest for faith, for hope, for hypomone. Peter was primarily a reader of the Bible, but as a Bible reader he also read the great Reformation theologians, who gave him the incomparable gift of wisdom and understanding and hope. We might say that Peter was and became what is called in Yiddish a Gelernter. In Jewish culture to be a Gelernter is a rare and honorable achievement. Many might aspire to become a Gelernter but not everyone has the leisure or the discipline or the motivation that it takes. A Gelernter is not necessarily a Rabbi or a professor. A Gelernter can be an ordinary Jew who manages to achieve extraordinary things. A Gelerner can be an ordinary saint who through diligent study of the sacred text attains to an extraordinary level of knowlege, wisdom and understanding. A Gelernter, in this sense, is an ordinary saint who is learned in the sacred text. Years ago I heard a story about a Gelernter in a sermon. I wish I could remember it better, but it went something like this. Once upon a time there was a Jew in a Polish village who worked as a tailor or a shoemaker. Somehow he came into some money. He no longer had to repair garments or shoes to make a living. He could do whatever he wished. So he fulfilled his lifelong dream and became a Gelernter. His wife and his family and everyone in the village were proud of him, a simple shoemaker who became a Gelernter. Of course he helped his relatives when they needed money, and he gave generously to the poor. But he did not see any of that as his deepest vocation. He enjoyed talking with the Rabbi and others in the synagogue, even as he applied himself night and day to the sacred text. He was once asked what he would say to the Lord God when he had to stand before him at the Last Judgment. The Lord would ask him, what did you do with your life? To which this former shoemaker felt he had a ready answer, the best answer he could possibly give. He would simply reply to the Lord God by saying: “I read the Book.” He belonged to the people of the Book, and he himself had been blessed to read the Book. Peter was a serious Christian. He came to church to worship God and to hear the Word of God. With his particular life struggles, he knew there was nothing that he needed more than to hear the Word of God be rightly proclaimed. And of course he did many things with his life. 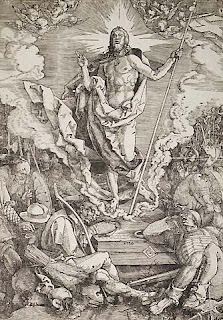 He loved the opera, he loved rowing, he loved Albrecht Dürer and other great works of art. He gave generously to the poor. But he was also one of those ordinary saints with an extraordinary attainment. He was an ordinary saint who, driven by interest and need, attained to the high stature of a Gelernter. He was not a professor or a minister. But he devoted himself to study some of the great theologians of the church. And he did so most of all because they helped him to understand the Book. Let us pray: Into your hands, O merciful Saviour, we commend your servant Peter. Acknowledge, we pray, a sheep of your own fold, a lamb of your own flock, a sinner of your own redeeming. Enfold him in the arms of your mercy, in the blessed rest of everlasting peace, and in the glorious company of the saints in light. Grant also, O Lord, to all who are bereaved, the spirit of faith and courage, that they may have strength to meet the days to come with steadfastness and patience, not sorrowing as those without hope, but in thankful remembrance of your great goodness, and in the sure expectation of a joyful reunion in the heavenly places. All this we ask through Christ our Lord, who lives and reigns with you and the Holy Spirit, one God now and for ever. Amen. A five-year ban on the word "trinitarian"